In today’s global market, the language barrier is one of the main obstacles to doing business abroad. Luckily, there are some great companies that provide amazing translation services to businesses (ahem… TranslateMedia). But it’s not just in business that language can be an obstacle. In fact, misunderstandings often happen in our personal lives, and usually with our partners – after all, the two genders communicate on different levels. That’s why this Valentine Day we were amused to learn that there is a clever app that hopes to bridge that communication gap for you. In a cheeky marketing exercise, jewellers “Mukhisisters” played on the classic “women say one thing and mean another” theme and built an app that allows men to translate what is being said by women into plain English. 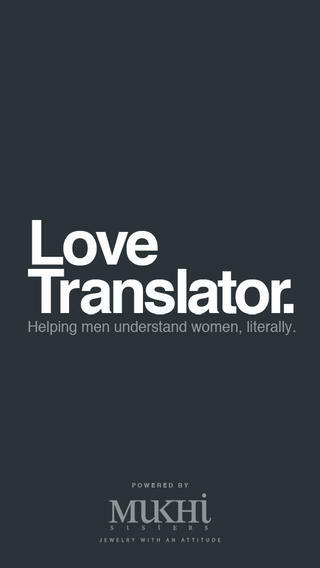 Upon reading the name of the app, the “Love translator”, we just had to download it (for research purposes of course). Here is how it works: the user inputs what their female companion says and the app tells them what she’s really thinking. As you can imagine, you can input the classic “It’s not you, it’s me” or “I like you” and will get more or less what you expect. Then, you get the option to “break the language barrier” by pressing a hammer icon. At this point, their suggestion is… to buy one of their pieces of jewellery, of course. Was it good for us? While we loved the idea, especially as a publicity stunt, the novelty of the app soon wears off. The most important contributing factor to the limited longevity is the size of its database of stored phrases. If you don’t “guess” correctly one of the pre-translated sentences, you will get a message that says “Sorry, we are still learning how to speak Female”, together with the option to add suggestions (in a way similar to Google Translate). Which brings us to the matter of machine translation, a favourite bugbear among translation professionals. Are they the great cost-savers you think? Are they potentially dangerous? To keep with the style of the article, our answer is: it depends how you use it. Machine translation technology is great for enterprises that have a huge amount of words to translate and could never human-translate it in time and at the right cost. Also, it is especially useful for user-generated content that is non-business-critical and does not need to persuade or convene a brand message – e.g. reviews or, in some instances, incoming online customer enquiries. For the average company, you wouldn’t want to risk it. Do not trust your marketing or brand with a machine. Also, in terms of content marketing and SEO, a machine cannot choose the right keywords for your target audience. The tools are growing at a fast rate, thanks in part to the ability to input sector-specific glossaries and previous translations into the tools, but they are far from being the time and money saving solutions you might think. In the less common language combinations, for example, post-editing the output of these tools is often a slower process than translating from scratch. Going back to our Love Translator app, one of the issues it will face, besides the limited user-base, is the lack of users willing to add suggestions (it would be interesting to know how many Google Translate users actively offer suggestions). Also, without moderation it is open to sexist or offensive user-generated translations. Although we do like to go on about translations and languages, we understand it is just a bit of fun and applaud the ingenious marketing stunt. If you want to have a go, you can download the app here.